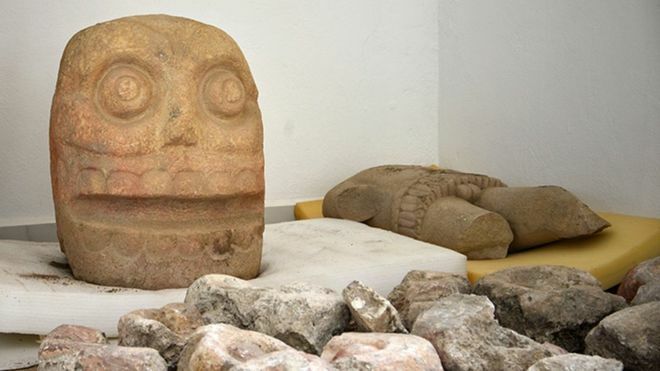 Mexican archeologists have discovered a temple dedicated to Xipe Tótec, translated to “The Flayed Lord.” The archeologists suspect the find is the earliest dedication to the deity that has been discovered in Mexico. Items used to worship and symbolize the deity was found in Puebla state, believed to date from 900-1150 AD. Ceramic statues and skulls carved from volcanic rock were found in relatively good condition, according to the archeologists. The skulls weigh about 200kg. INAH archeologists believe the skulls were used with sacrifices to the deity by acting as covers for holes in sacrifice altars.